Mix canned pumpkin, whipped topping and marshmallow cream for a show-stopping Festive Pumpkin-Marshmallow Pie. Your Thanksgiving deserves a Festive Pumpkin-Marshmallow Pie on the dessert table. Mix crumbs and butter. Reserve 1/4 cup crumb mixture; press remaining mixture onto bottom and up side of 9-inch pie plate. Refrigerate until ready to fill. Beat pumpkin and marshmallow creme in large bowl with mixer or whisk until blended. Gently stir in 2 cups COOL WHIP; pour into crust. Sprinkle with reserved crumb mixture; cover. Freeze 4 hours or until firm. Remove from freezer. Top with remaining COOL WHIP and nuts. Place in refrigerator 30 min. before serving to soften slightly. 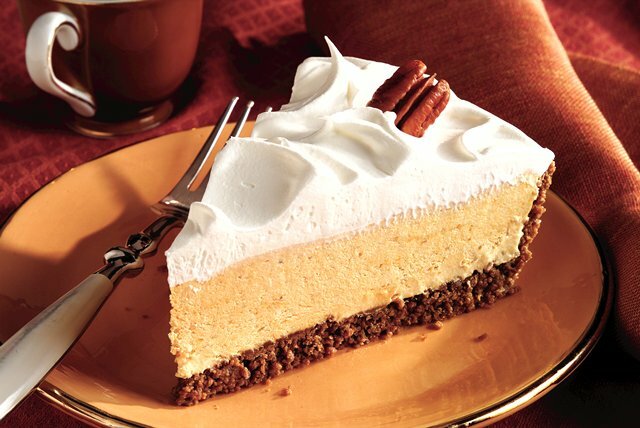 This easy, no-bake pie is a great dessert idea for your holiday parties. Use blender or food processor to quickly process cookies into crumbs.